I used the Alcohol Pearl inks and created two backgrounds - one on Yupo paper (card on the left) and one on Silver Sparkle Alcohol Paper (card on the right). I also used the Delicate Flowers stamp set that comes in the kit (and is also available separately - links to everything below!). I white heat embossed the images from the Delicate Flowers set onto vellum and fussy cut them, and white heat embossed them directly onto the Yupo paper background. To finish the insides of the cards I stamped some of the images with Distress Oxide inks in colors that went well with the Pearl Alcohol ink backgrounds. The sentiments on the insides and fronts were from the Delicate Flowers stamp set and white heat embossed onto Cotton Candy card stock before being die cut with the Sentiment Labels wafer dies. Ahhhh it's been a good (AKA productive - as in I've got videos filmed and posted AND a ton of laundry done lol) weekend so far! Icing on the cake was the Simon Says Stamp May Card kit showing up! I get the kits earlier than customers since I design for SSS, but at times the post can take WAY longer than usual. This one showing up early was so nice as it was a real surprise this time (usually I've seen the contents online etc etc before filming my unboxing video) - AND I can tell this one's going to be popular!! And here are the links! Happy weekend!! I had a lot of requests to film a Release & Review video on Simon Says Stamp's Blossoms and Butterflies release. I die cut all the things and wanted to get this filmed and posted since the release was a few days ago AND I have all these die cut pieces sitting here and am knocking them all over the place LOL! Happy Friday again!! I'm SUPER excited to be a part of a special hop for Waffle Flower's NEW Water Media Mat. They revealed the mat at Creativation at the beginning of the year and everyone's been chomping at the bit to get one ever since!! It doesn't look like much in it's product picture - but trust me it's AMAZING - and it's also a lot bigger than it seems (outside dimensions are about 17.5 x 11"). You can pre-order the mat HERE <-------click! and they're expected to start shipping out in about a week!! 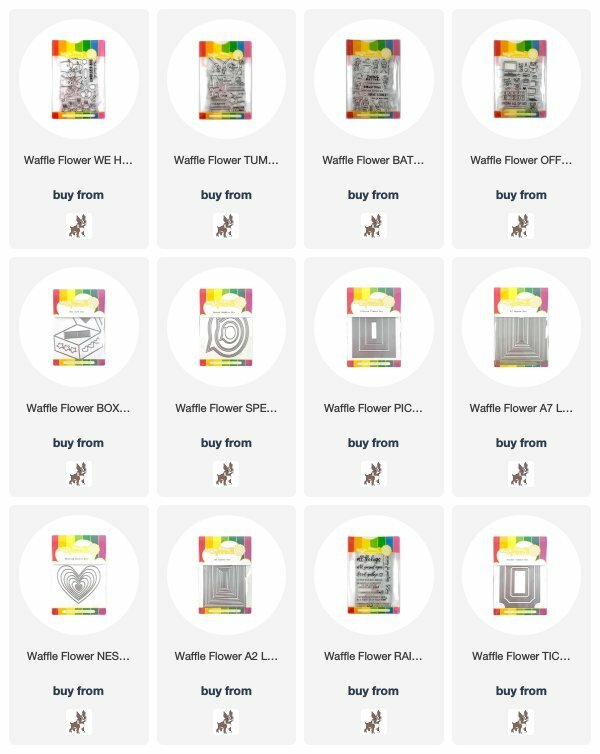 Not only are there these graphics - Waffle Flower has been posting videos all week and we're all doing videos for this hop today showing a bunch of different ways to use this mat. You can find all the links to the participants in the hop HERE on the Waffle Flower Blog. Also stay tuned to the end of the post as there's GIVEAWAY info!! I used the new Bouquet Builder 3 stamp set for this card and stamped all the images onto water-colour paper with Versafine Clair Nocturne ink. I then used Distress Inks to watercolor the flowers with a paintbrush and water. The background of the card was made with Distress Inks and some Distress Oxide ink smooshing on the Water Media mat. Once everything was dry and assembled I added a bunch of Nuvo Dream Drops in Dragon Scales and Cloud 9. I kept the inside of the card simple and just stamped the large bouquet with Tumbled Glass Distress Oxide ink and that was it! To celebrate the blog hop, Waffle Flower is giving away a $25 gift certificate. AND Waffle Flower will be choosing 3 random winners to receive a Water Media Mat!! This giveaway is open internationally!! You can leave comment on my blog and along the hop by 11:59pm ET on 4/15/19 for your chances to win. 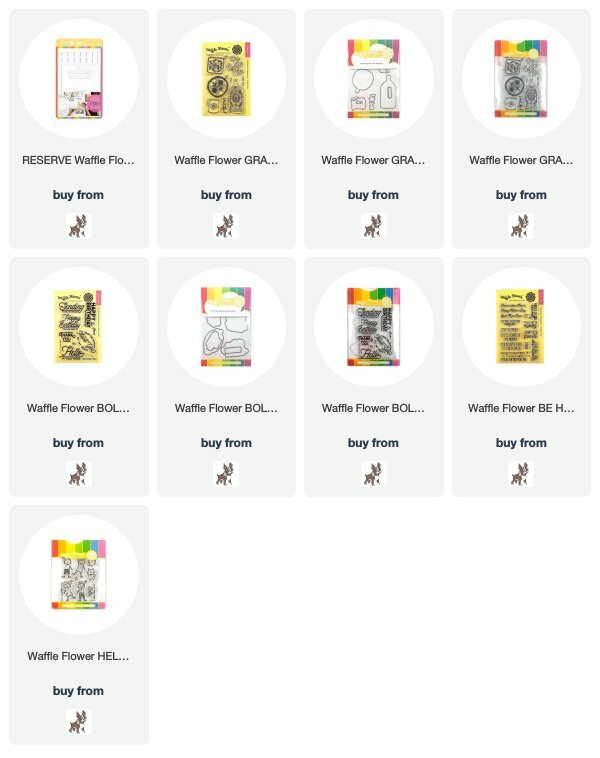 Winners will be chosen at random from the comments left on any of the posts on this blog hop and will be announced on the Waffle Flower blog on 4/17/19. You can check out the release HERE <------click! and I have links to all of it below (I'll have a Release & Review video hopefully up this weekend - it's been a crazy week as usual). Today is Day 1 of two days of blog hops full of inspiration for this release! I'll have links to all the stops on the hop below as well as giveaway info!! I made 2 cards using the new Bouquet of Roses Stencil and sentiments from the Wake Up and Makeup stamp set (stay tuned for more cards with that set - I am in LOVE with it!!). I blended 4 colors of Simon's inks over the stencil with one of my Picket Fence Life Changing Blender Brushes, and then on the card on the left I added Tonic's Nuvo Moonstone Glimmer Paste. On the card on the right I added a bit of splatter with Distress Oxide Sprays. I finished the insides of both cards with more stencilling and then added another sentiment from the Wake Up and Makeup set and that was it! 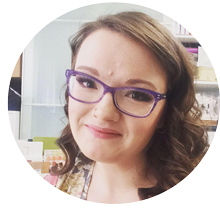 Next stop on the hop is Heather's blog!! <------click! Simon Says Stamp is giving away a $25 coupon to every stop on the hop (thanks Heidi!!) from each blog's comment section (so leaving comments on all the blog posts of the hop increases your chances of winning!). Simon will choose the winners over the weekend and post on the Simon Says Stamp store blog on Wednesday (04/17). All the winners can email Simon Says Stamp to claim his/her prize. Hello everyone!! Can't believe it's Thursday already - keep checking in here on my blog as I have a LOT going on over the next couple of days on here LOL! Now for a fun and EASY interactive card using some of the new stamps and Die-namics! My card starts off as a simple gate-fold card made from Kraft card stock. I created a wrap with patterned paper and used the new Polaroid Shaker Frame Die-namics, and paired it with one of the images from the new Picture Perfect stamp set (animals taking selfies? Yes please). I used the new Shutter Card Components Die-namics to make a movable "shutter" that opens as the sides of the card are opened - and it reveals the selfie-taking hamsters in full color. SO. CUTE. AMIRIGHT? I don't "do" many interactive cards - I just am not a fan if it takes a ton of thought and effort (my mind is always on a million other things constantly lol). This however was super easy to put together - and the result is so fun. I highly recommend trying one out! I pulled out some of Tonic's Glimmer Pastes and Honey Bee's stencils and since I couldn't decide (as usual) on which one of each to use so I decided to make 4 cards with 4 different stencils and 4 colors of Glimmer Paste lol! I applied the various Glimmer Pastes over the stencils and black card stock - let them all dry then cut them down to slightly smaller than A2 card fronts. I used Honey Bee's Because sentiment set and gold heat embossed the sentiments onto vellum. I then used the largest of the Banner Builder dies to cut them out and wrapped them around each stencilled piece before adhering them to the card bases. I finished off the insides of the cards with more sentiments from the Because stamp set that I gold heat embossed onto black card stock and die cut with a smaller of the Banner Builder Honey Cuts dies and that was it! Hello everyone!! It's time for Waffle Flower's April release! I'm part of the blog hop today and there are giveaways and all sorts of exciting things going on for this release! First off - the April release is a smaller one (especially compared to the MASSIVE March release!). Waffle Flower wanted to keep this release smaller as we're concentrating on some of the new March products that were released, with some add-ons this month. PLUS you can now pre-order the highly anticipated Water Media Mat!! I have links to the release below as well as to the pre-order and there will be more info (and videos!) coming on the Water Media Mat in about a week so stay tuned! With the new release we're also focusing on the Birthdays and Basics items that Waffle Flower released last month as Waffle Flower turns 5 this month!! I did a Release & Review video showing all these HERE if you missed it! OK now on to my cards. I created 2 fun and easy backgrounds for my cards using Distress Oxide Sprays. I simply masked off the areas with acetate and scraps of copy paper and sprayed the card stock. Once I was finished I die cut each background with the second largest A2 Layers wafer die. I used the new Tumble On and Batter stamp sets for my cards. I ADORE these character stamps from Waffle Flower - there's just something about them that really appeals to me! I stamped all the images onto Neenah Classic Crest Solar White card stock with Ink on 3's Blackout Ink and did some really simple Copic colouring. I think that's one reason why these images appeal so much - they don't require a ton of in-depth colouring etc - they're cute enough as-is LOL! I finished off the insides of the cards with the remaining characters and sentiments and that was it! Next stop on the hop is Keeway's blog! <--------click! To celebrate the blog hop, Waffle Flower is giving away $25 gift certificates to THREE lucky winners. You can leave comment on my blog and along the hop by 11:59pm ET on 4/7/19 for your chances to win. Winners will be chosen at random from the comments left on any of the posts on this blog hop and will be announced on the Waffle Flower blog on 4/9/19. You can check out the challenge HERE <---------click! to see what the rest of the team created using these colors and to play along if you'd like! I used my MUCH loved Simon Says Stamp Beautiful Flowers stamp set for my card. I LOOOOVVVEEE this set (hence the "take 8" in the title - this is the 8th video/post I've done using it LOL!) and still reach for it often. I created a mask for the image using my big Judikins Eclipse masking roll (linked in the supplies below). I remember way back (I'm talking over 10 years ago) when these became available and how hard they were to get and how I literally saved up to get myself one. Like I mention in the video they disappeared for a long time and I stopped using mine as I don't like showing products that you can't get anymore (the comments and emails I get when I do get extreme sometimes). However it's been back for some time now as well as a TON of other masking products (we have soooooo many more options now than we used to!) so I thought I'd use it again today! Anywho - I stamped and masked the flowers, then blended on Watering Can dye ink by Wendy Vecchi. I then added some splatter with Iced Spruce Distress Oxide Spray, removed the mask and coloured the images in with Copics. I finished off the inside of the card by stamping the flowers with Squeezed Lemonade Distress Oxide ink and pairing the card with a bright yellow envelope and that was it! And just like that it's April already. CRAZY!! Aren't they fun? I used Simon Says Stamp's Nested Eggs wafer dies to die cut the background I'd created, and then nestled them into some "grass" I die cut from Green Apple card stock. I used the Clouds for Days stencil with Maliblue ink on the background, and the Easter Wishes words from the Bunny Kisses wafer die for my sentiment. I kept the inside of the card simple and just adhered the remaining Easter eggs I'd die cut and that was it! Happy Friday!!!! First off - if you missed my SALE post from last night - here's the info!! Now Until 3/31 at 11:59pm ET, only one code per order. Cannot be combined with other codes. Not valid on previous purchases, card kits or card kit subscriptions. You can check out what the rest of the team created with this color combo HERE <------click! and there's still time to play along and submit your card if you'd like!! I made a few cards using a "faux" no watercolor technique a couple of weeks ago using water-reactive inks (you can check out that post HERE if you missed it) and wanted to do something similar again. This time I used Distress Inks which are definitely water reactive - and have colors that would work for this color challenge! I heat embossed the florals from Simon Says Stamp's Beautiful Flowers 2 stamp set onto Bee watercolor paper using Hero Arts White Satin Pearl embossing powder. I then rubbed Distress Ink mini pads directly over the images and sprayed them liberally with water. Once dry I die cut them with the coordinating wafer dies. I used the same embossing powder to heat emboss Simon's Quilted Hearts background onto the Ivory card base, then sprayed the card base with Peeled Paint Distress Oxide spray. I used the spray on the inside of the card, and also stamped the big floral cluster with Milled Lavender Distress Oxide ink. I added a white heat embossed sentiment from the Beautiful Flowers 2 stamp set and that was it! SO. MUCH. PURPLE. These were fun to make and really one can never have too much purple, or sparkle or shimmer IMO! I white heat embossed 2 different Simon Says Stamp backgrounds onto Bee Watercolor paper - the new Pretty Peonies Background and the Abstract Triangle Background. I then used the newest Tonic Nuvo Shimmer Powder (Lilac Waterfall) on the Abstract Triangle Background piece (on the left) and used Tonic's Violet Brocade Shimmer Powder on the Pretty Peonies Background. Once those were dry I used Simon's Triangle Blast Stencil over them (I was completely inspired by THIS gorgeous card Debby made) - using Moonstone Glimmer paste over the Pretty Peonies background and Tanzanite Lavender Glimmer paste over the Abstract Triangles background. I finished off the insides of the cards with a sentiment from Simon's Thankful Heart stamp set stamped with Dusty Concord Archival ink and that was it! Or watch in HD over on YouTube HERE <----------click! Ahhhhh Monday......I have SO much catching up to do after having a pretty rough week last week. I have had MFT's March release sitting here all month just begging to get inky and creative with. You can check out that release HERE <-------click! I white heat embossed the Fresh-Cut Flowers Background onto Bee watercolor paper and then used my Prima Pastel Dreams palette to watercolor in the flowers and background. I white heat embossed a sentiment from the new Anything-But-Basic Encouragement stamp set onto vellum and wrapped it around my watercolor panel before adhering it to the card base. I also used the new Nuvo Dream Drops on the card - these are SOOOOO pretty in real life, AND they are a duo chrome - meaning they look completely different on light and on dark card stock (I show swatches in the video). On the inside of the card I stamped the Fresh-Cut Flowers again - this time with Abandoned Coral Distress Oxide ink. For the sentiment I white heat embossed it onto vellum, then ran the sentiment strip through my little Xyron X sticker marker to put adhesive all over the back of it. That way I could press it into place and no adhesive actually shows. I used the Rainboot Planter wafer die that comes in the kit, and die cut it from watercolor paper and then used a combo of Prima's Pastel Dreams and Tropicals watercolor palettes to color the image. I used patterned papers from the kit to make up my card front, and heat embossed one of the sentiments from the Hello Darling stamp set onto the woodgrain patterned paper. I added the Bohemian Teal Nuvo Vintage Drops to my card and let them dry overnight before taking these pics. The Vintage Drops <------click to see all the colors - dry matte unlike the other Nuvo Drops in the line which have a glossy (or sparkly) finish. I finished off the inside of the card with another heat embossed sentiment from the Hello Darling stamp set and added another strip of patterned paper and that was it!